Wendelstein 7-X is the world’s largest and most advanced nuclear fusion device of the stellarator type. Its objective is to test whether a new source of energy could emerge for humanity from fusing light atomic nuclei. “Wendelsteinstrasse 1” is the address where the “largest thermos flask in northern Germany” is located. On one side of the road, arable farmland stretches far into the distance. On the other side, the main building of the Max Planck Institute for Plasma Physics (IPP), with its roof that resembles a long wave, flows directly into a large experimentation hall. On the outskirts of the town of Greifswald, with its population of 58,000 inhabitants, IPP researchers are in the process of opening up new perspectives in the field of nuclear fusion research—with the help of a device to which they have given this evocative nickname. Up here in Mecklenburg-West Pomerania, the researchers are working on a dramatic project, which may now be about to see a breakthrough after several decades of relative obscurity—nuclear fusion research. And it involves a race between two approaches: Wendelstein—which is the name for the so-called stellarator in Germany—and its great rival, the tokamak. The names stand for different concepts which aim at using the atomic heat of the Sun to generate energy on the Earth. In nuclear fusion, two light atomic nuclei combine to create a new, heavier nucleus, which releases a large amount of energy. This is a continuous process on the Sun. The bubbling mass of particles at a temperature of many million degrees, which physicists call plasma, can only be captured on Earth by means of magnetic fields, however. This happens differently in the tokamak to the way it happens in the stellarator. The stellarator was originally developed in parallel to the tokamak, but was soon left behind at later stages of development: in the 1970s and 1980s, the tokamak seemed to be the more promising alternative. Nowadays, however, devotees of the stellarator are starting to catch up. For example, in Greifswald, where the first stage of development of Wendelstein 7-X has been operational since the end of 2015. It is located in the large experimentation hall, which is known as the Torus Hall. Nobody knows their way around here as well as Torsten Bräuer, the head of the survey team. Together with his colleagues, he placed the three-and-a-half-meter-high main coils, of which there are 50, in precise position to within one and one and a half millimeters—in the shape of a circle, in which the plasma will flow later and the diameter of which is eleven meters “at the soul of the plasma,” as Bräuer describes it. At any rate, the famous coils are not visible. They are hidden behind a huge steel outer shell and numerous terminals and cables. The niobium-titanium magnets and parts of the plasma vessel are encased in an enormous cold chamber. This is where the nickname the “largest thermos flask” comes from. In this cold chamber, the coils and their support structures, amounting to about 425 metric tons of steel, are cooled to a temperature of around minus 270 degrees Celsius. At this temperature, electricity flows without resistance—it is superconductive. Only in this way can the coils develop sufficiently strong magnetic fields. The cold chamber itself has about 255 so-called ports—apertures, through which sensors, electrical connections, sensor signals, or cooling water can be introduced into the plasma vessel. There it stands, Wendelstein 7-X, a giant in a cooling jacket, wired up and connected to pipes as if it were in the intensive care unit. Diagnosis: in perfect health. What do the researchers at IPP expect from the technology of the stellarator, which, in contrast to the tokamak, has not managed to achieve any convincing plasma confinement for decades? “Wendelstein 7-X has a very clear mission,” says Prof. Thomas Klinger, the Scientific Director at the Greifswald site. “It is a newly developed confinement concept.” The stellarator concept is fairly old, he says. But only now have advances in numerical mathematics and modern supercomputers made it possible to investigate the question of what an optimal magnetic field should look like. Theoretical concepts for this were available around the end of the 1980s, according to Klinger. Then in 2003, the first parts for Wendelstein 7-X were delivered to Greifswald—for comparable major devices, that is record-breaking speed. These concepts, which have since been further developed, have been integrated into the Greifswald device. The result is a completely new geometry: the torus with the magnets is no longer a round tire shape, around which the magnets twist. From above, it resembles a five-sided figure, or pentagon. The machine consists of five identical modules, each with ten of the twisted, so-called non-planar coils and four others, which are used for precision adjustments. Each of the five modules consists of two mirror symmetric half modules so that the same type of coil can be installed twice. For this reason, Wendelstein contains fifty non-planar coils, but only five different types of coils—which makes it much simpler for industrial manufacturers to produce. This geometry now needs to prove itself. But Wendelstein 7-X is not designed to ever generate energy. “With its plasma volume of thirty cubic meters, it is much too small for that,” says Klinger. Its role is of a more basic nature: “The aim is to demonstrate that the optimization process of the magnetic field is so successful that the Wendelstein, with its 30-cubic-meter plasma volume, can compete with any tokamak of a comparable size in the world.” That would really shake things up. If this were to succeed, Wendelstein 7-X would be able to exploit its conceptual advantage: “By its nature, the stellarator is capable of operating in continuous mode.” The tokamak can only work in pulsed mode. It sustains the plasma for a period of time equating to a long inhalation of air. Then it goes out and has to ignite again. The researchers at Greifswald intend to gradually upgrade their Wendelstein 7-X device over the coming years in order to eventually achieve a continuous operation time of half an hour, i.e. keeping the plasma stable for half an hour. This should be achieved by 2020. When Hans-Stephan Bosch inserts his key and leads the way to the control room, you get a sense of what operation of the device might look like during this type of continuous operation mode. Bosch manages the operation of Wendelstein 7-X. When the machine is running, this room is his kingdom. With a little imagination, you feel as if you are in the futuristic setting of a huge spacecraft, although one that has yet to come into its own. Because it is still currently being reorganized; there is no humming or buzzing in the control room, it is dark, no one is running around, and the monitors on the front wall are switched off. 70 to 100 people will be sitting here, running around, and coordinating activities when the machine is working. The architecture is extravagant: the workstations—black chairs, light-colored desks—are grouped together by task. The 22-meter-long main control desk extends through the room past these clusters of desks. At this main desk alone, there will be 30 pairs of eyes monitoring the machine. 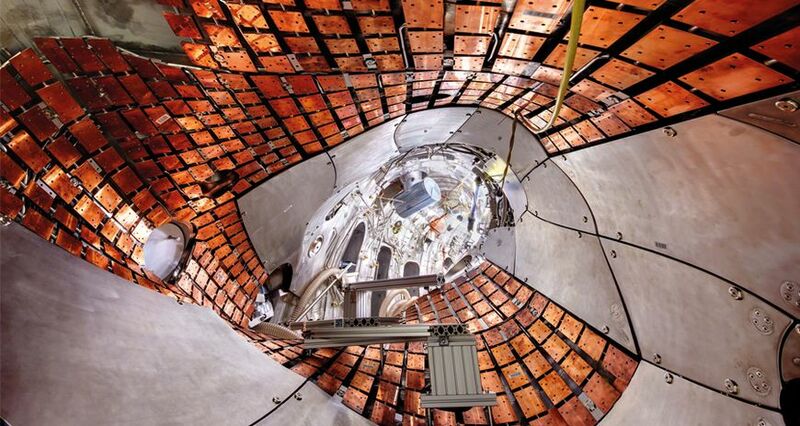 Wendelstein will gradually see further phases of reconstruction in the years to come. At the moment, the inner walls of the plasma vessel are being clad with graphite tiles in areas where the plasma beam has the highest impact. In addition, so-called divertors, which are also graphite plates, have been built into the top and bottom of each segment of the plasma vessel and impurities from the plasma are removed onto these plates during operation. The disruptive waste is then extracted directly from there. The principle of divertors (deflectors) is also used in other plasma systems. Wendelstein 7-X did not need them in the first test phase. Later on, however, in continuous operation, the divertors will even need to be water-cooled in order to cope with the powerful impact of the large amounts of energy involved. During the next stage of the experiments, however, they will remain uncooled for the time being, so continuous operation will not be possible. But Wendelstein can still achieve the performance range of a well-functioning tokamak, even without the cooling system, Klinger says. You can tell that he would very much like to celebrate this small victory. He should be able to do so in the late summer. Our sun delivers huge amounts of energy to us every day. But we are only making use of a small percentage of it. If Kathrin Aziz-Lange had her way, this situation would soon be changed. The explosion is up to 263 decibels loud that Thomas Jordan creates at his work-station. Compared to this, a jet taking off with its 110 decibels sounds almost like a whisper. Can a system of decentralised power supply pay off? Tomorrow’s approach to power generation will be decentralised and fluctuates according to weather conditions. Peter Wasserscheid tells us what is important.